Download "Industrial Cyber Security Risk Manager. Proactively Monitor, Measure and Manage Cyber Security Risk"
2 With Today s Cyber Threats, How Secure is Your Control System? Today, industrial organizations are faced with new business models and technologies, changes in government regulations, and increased global competition. One result of this dynamic environment is that automation assets are no longer truly isolated. Information availability expanded with the evolution from proprietary control solutions using specialized hardware and software, to low-cost Internet Protocol (IP) devices and applications. However, this trend exposed the manufacturing enterprise to growing cyber security challenges. 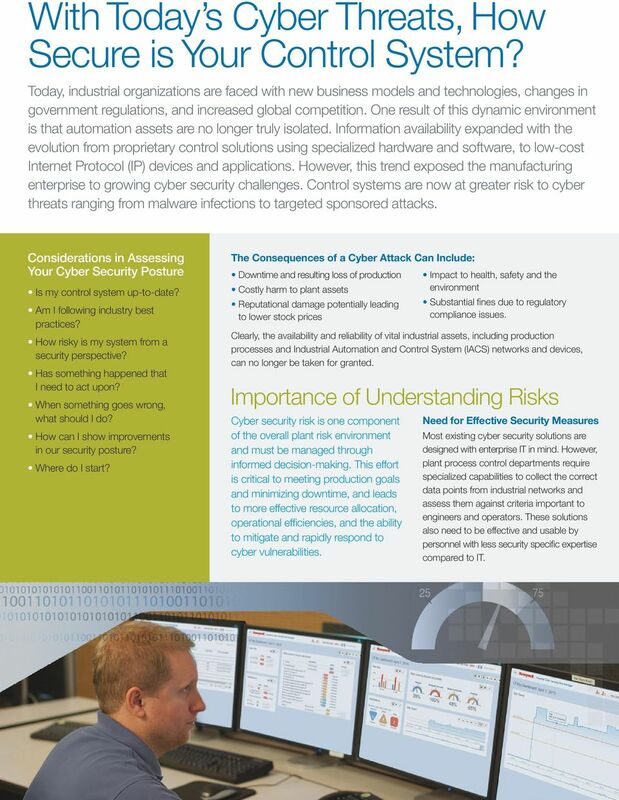 Control systems are now at greater risk to cyber threats ranging from malware infections to targeted sponsored attacks. Considerations in Assessing Your Cyber Security Posture Is my control system up-to-date? Am I following industry best practices? How risky is my system from a security perspective? Has something happened that I need to act upon? When something goes wrong, what should I do? How can I show improvements in our security posture? Where do I start? The Consequences of a Cyber Attack Can Include: Downtime and resulting loss of production Costly harm to plant assets Reputational damage potentially leading to lower stock prices Impact to health, safety and the environment Substantial fines due to regulatory compliance issues. Clearly, the availability and reliability of vital industrial assets, including production processes and Industrial Automation and Control System (IACS) networks and devices, can no longer be taken for granted. Importance of Understanding Risks Cyber security risk is one component of the overall plant risk environment and must be managed through informed decision-making. This effort is critical to meeting production goals and minimizing downtime, and leads to more effective resource allocation, operational efficiencies, and the ability to mitigate and rapidly respond to cyber vulnerabilities. Need for Effective Security Measures Most existing cyber security solutions are designed with enterprise IT in mind. However, plant process control departments require specialized capabilities to collect the correct data points from industrial networks and assess them against criteria important to engineers and operators. These solutions also need to be effective and usable by personnel with less security specific expertise compared to IT. 3 Get Proactive with Risk Manager Improving situational awareness is critical with cyber security because you can t fix what you don t know about. And making sure everyone is able to quickly assess a security situation is a constant goal. Industrial facilities have clearly become targets for cyber attacks. Safety and operational continuity demand a clear understanding of these serious, dynamic risks and a program to ensure that they remain within acceptable levels. While most organizations recognize this need, operational people often lack the expertise to properly assess and manage cyber risks, said Sid Snitkin, Vice-President, ARC Advisory Group. So, we applaud Honeywell s development of Cyber Security Risk Manager. From what we ve seen, it is a comprehensive, yet understandable, solution that should meet the needs of operational, automation, and manufacturing IT personnel. Industrial firms must address a variety of new challenges associated with IACS characteristics that differ from traditional information processing systems. Furthermore, the goals of safety and efficiency sometimes conflict with security in the design and operation of control systems. 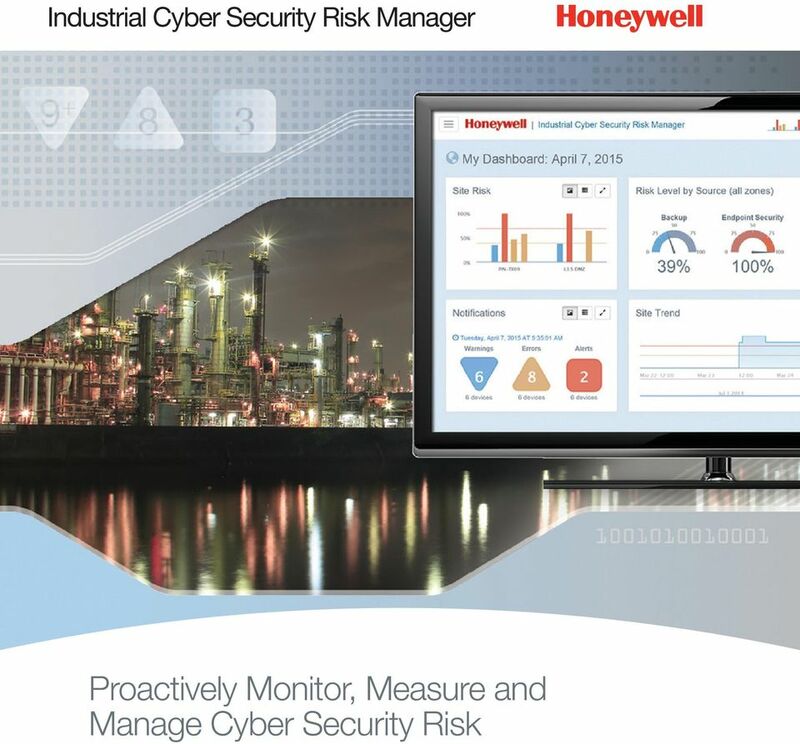 Honeywell s Industrial Cyber Security Risk Manager is the first solution to proactively monitor, measure and manage cyber security risk for industrial plants and systems, providing users of all levels with real-time visibility, understanding and decision support required for action. With Risk Manager, there s no need to be a cyber security expert. 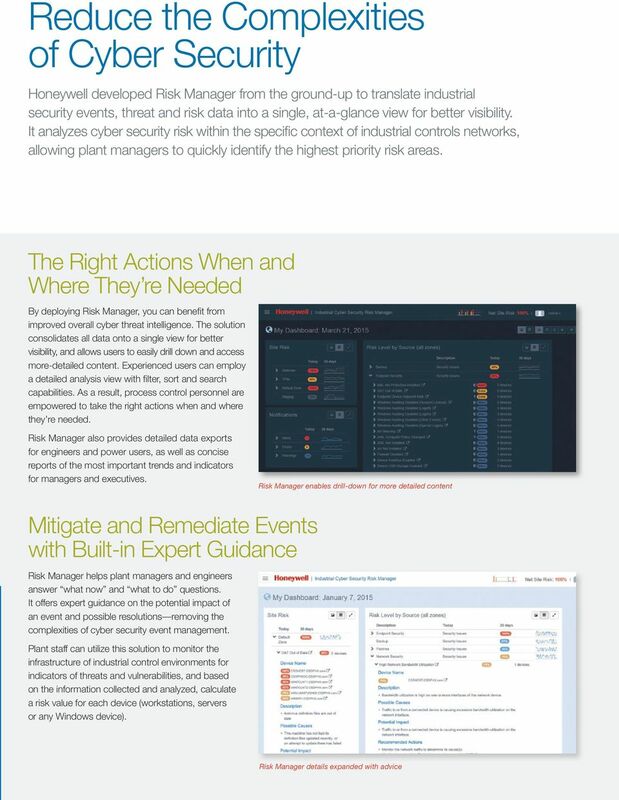 Through a user-friendly interface, Risk Manager allows users to prioritize and focus efforts on managing risks that are most important for reliable plant operations. Honeywell s approach with Risk Manager brings innovative cyber security and risk intelligence to plants and critical infrastructure sectors to meet the new and urgent cyber security needs of industrial environments. Risk Manager provides users with a real-time assessment of information from devices throughout the process control network, enabling them to monitor, measure and manage their cyber security risks in a way not provided or possible before. 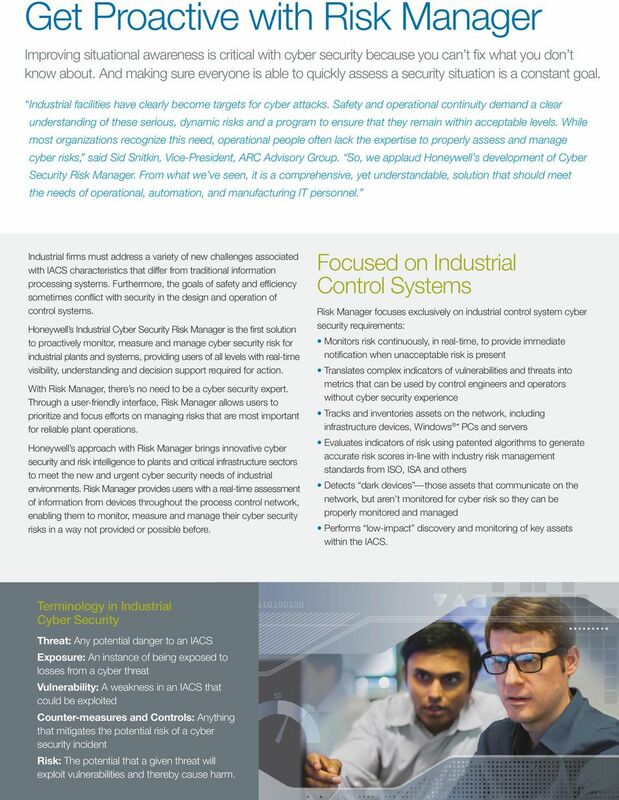 Focused on Industrial Control Systems Risk Manager focuses exclusively on industrial control system cyber security requirements: Monitors risk continuously, in real-time, to provide immediate notification when unacceptable risk is present Translates complex indicators of vulnerabilities and threats into metrics that can be used by control engineers and operators without cyber security experience Tracks and inventories assets on the network, including infrastructure devices, Windows * PCs and servers Evaluates indicators of risk using patented algorithms to generate accurate risk scores in-line with industry risk management standards from ISO, ISA and others Detects dark devices those assets that communicate on the network, but aren t monitored for cyber risk so they can be properly monitored and managed Performs low-impact discovery and monitoring of key assets within the IACS. Terminology in Industrial Cyber Security Threat: Any potential danger to an IACS Exposure: An instance of being exposed to losses from a cyber threat Vulnerability: A weakness in an IACS that could be exploited Counter-measures and Controls: Anything that mitigates the potential risk of a cyber security incident Risk: The potential that a given threat will exploit vulnerabilities and thereby cause harm. 4 Gain Visibility of Potential Threats Risk Manager was specifically designed to translate a myriad of complicated industrial cyber security activity into easily identifiable metrics so potential threats can be identified, risks can be managed and mitigated, and a strong cyber security posture maintained. Improve Workflow and Meet Operational Requirements Plant Management: Provide updates on the site s security posture, including accurate measurements of risk aligned with industry standards Help focus resources on addressing threats Maintain uptime and meet production goals and other core business objectives Gain the know-how to prioritize efforts to manage risk Assess the impact of security controls on automation performance Establish and improve metrics for out-of-date patches and anti-malware. Control Systems Engineers: Anticipate cyber security scenarios Plan for protective measures/safe operating procedures Understand how possible attacks might disrupt operations Monitor the IACS for indicators of threats Track/monitor assets according to different zones. Executives: Demonstrate cyber security due diligence to board of directors, investors and regulators Map key risk indicators to KPIs Demonstrate the value of cyber security investments Incorporate meaningful cyber security risk ratings into risk management frameworks and evaluate compliance efforts. Risk Manager user interface Benefits of the Risk Manager Solution Detect potential problems before they impact security Ensure greater awareness of new threats Establish a baseline for improved cyber security posture Demonstrate due care to improve IACS reliability and availability Augment internal staff with expert cyber security guidance. 6 Risk Manager contributes to plant operational performance objectives, creating multiple opportunities for positive returns. 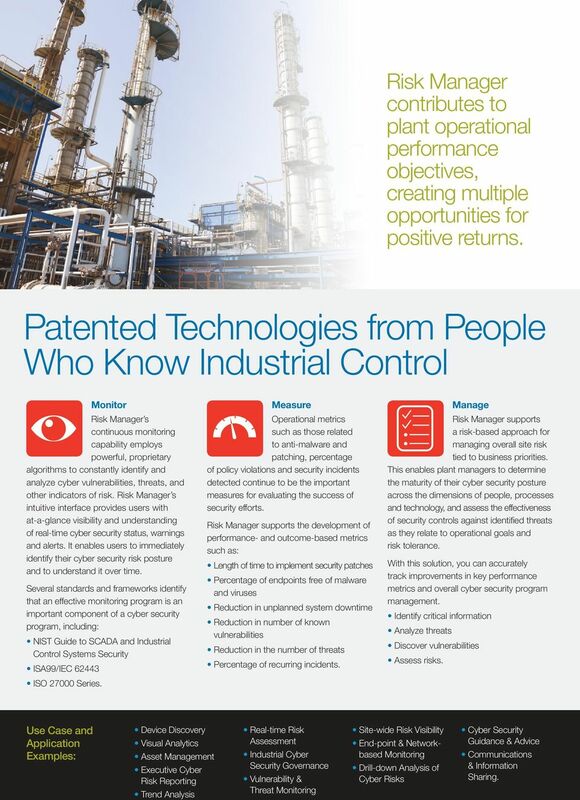 Patented Technologies from People Who Know Industrial Control Monitor Risk Manager s continuous monitoring capability employs powerful, proprietary algorithms to constantly identify and analyze cyber vulnerabilities, threats, and other indicators of risk. Risk Manager s intuitive interface provides users with at-a-glance visibility and understanding of real-time cyber security status, warnings and alerts. It enables users to immediately identify their cyber security risk posture and to understand it over time. Several standards and frameworks identify that an effective monitoring program is an important component of a cyber security program, including: NIST Guide to SCADA and Industrial Control Systems Security ISA99/IEC ISO Series. Measure Operational metrics such as those related to anti-malware and patching, percentage of policy violations and security incidents detected continue to be the important measures for evaluating the success of security efforts. Risk Manager supports the development of performance- and outcome-based metrics such as: Length of time to implement security patches Percentage of endpoints free of malware and viruses Reduction in unplanned system downtime Reduction in number of known vulnerabilities Reduction in the number of threats Percentage of recurring incidents. Manage Risk Manager supports a risk-based approach for managing overall site risk tied to business priorities. This enables plant managers to determine the maturity of their cyber security posture across the dimensions of people, processes and technology, and assess the effectiveness of security controls against identified threats as they relate to operational goals and risk tolerance. With this solution, you can accurately track improvements in key performance metrics and overall cyber security program management. Identify critical information Analyze threats Discover vulnerabilities Assess risks. Use Case and Application Examples: Device Discovery Visual Analytics Asset Management Executive Cyber Risk Reporting Trend Analysis Real-time Risk Assessment Industrial Cyber Security Governance Vulnerability & Threat Monitoring Site-wide Risk Visibility End-point & Networkbased Monitoring Drill-down Analysis of Cyber Risks Cyber Security Guidance & Advice Communications & Information Sharing. 7 Partner with Honeywell to Protect Your Critical Assets As new threats emerge and cyber security demands evolve, you need a trusted partner to help protect the availability, reliability and safety of your control system assets, as well as safeguard people and processes involved in all facets of your operation. Honeywell has a 50-year history as a leader in industrial safety and security, and as an innovator in the field of plant automation. Years of providing industrial cyber security solutions have yielded proprietary methodologies and a comprehensive approach to meet customer requirements. 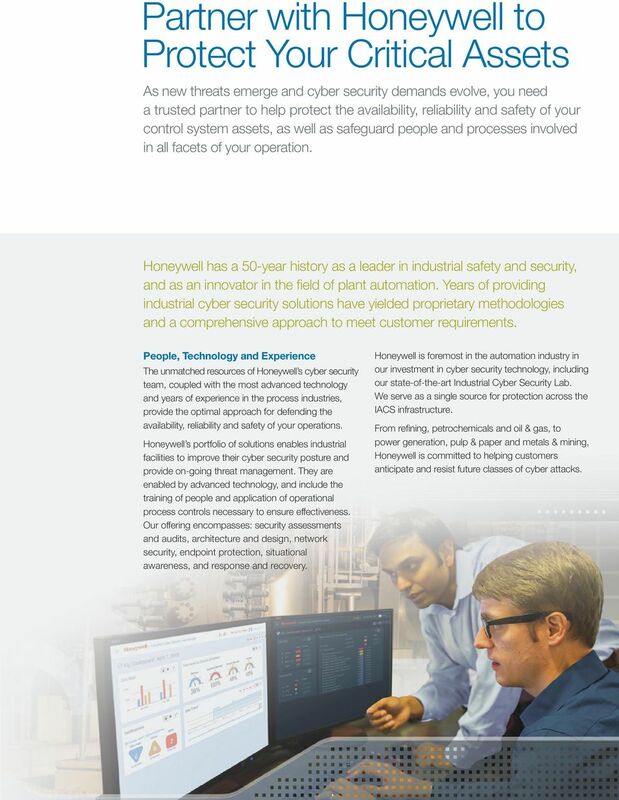 People, Technology and Experience The unmatched resources of Honeywell s cyber security team, coupled with the most advanced technology and years of experience in the process industries, provide the optimal approach for defending the availability, reliability and safety of your operations. 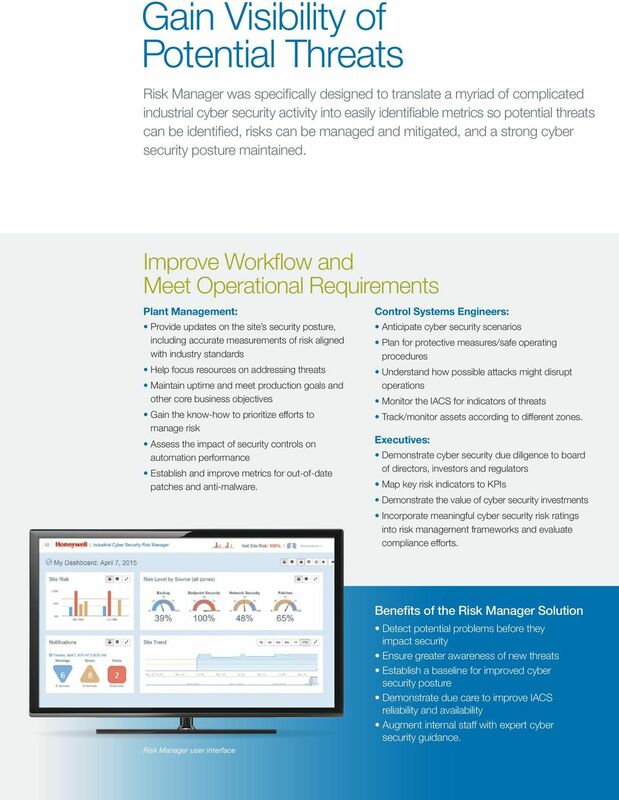 Honeywell s portfolio of solutions enables industrial facilities to improve their cyber security posture and provide on-going threat management. They are enabled by advanced technology, and include the training of people and application of operational process controls necessary to ensure effectiveness. Our offering encompasses: security assessments and audits, architecture and design, network security, endpoint protection, situational awareness, and response and recovery. Honeywell is foremost in the automation industry in our investment in cyber security technology, including our state-of-the-art Industrial Cyber Security Lab. We serve as a single source for protection across the IACS infrastructure. From refining, petrochemicals and oil & gas, to power generation, pulp & paper and metals & mining, Honeywell is committed to helping customers anticipate and resist future classes of cyber attacks. 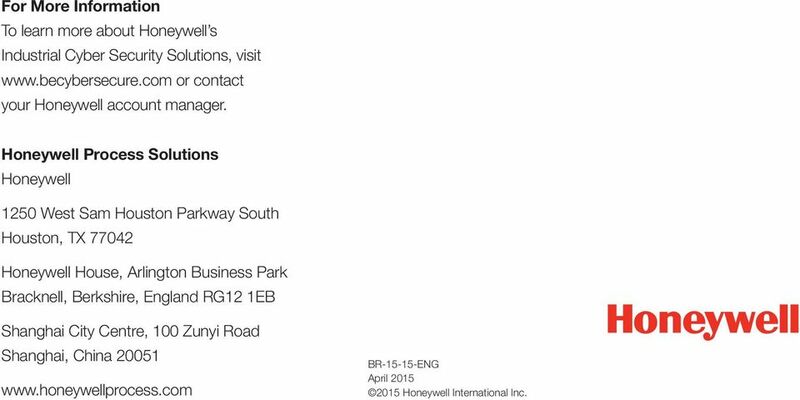 8 For More Information To learn more about Honeywell s Industrial Cyber Security Solutions, visit or contact your Honeywell account manager. Honeywell Process Solutions Honeywell 1250 West Sam Houston Parkway South Houston, TX Honeywell House, Arlington Business Park Bracknell, Berkshire, England RG12 1EB Shanghai City Centre, 100 Zunyi Road Shanghai, China BR ENG April Honeywell International Inc.
Is it the world s most powerful Alarm Management solution? Is it the world s most widely used Operations Management solution? No, it s both. Total Protection for Compliance: Unified IT Policy Auditing McAfee Total Protection for Compliance Regulations and standards are growing in number, and IT audits are increasing in complexity and cost. Migration Services Getting the Most from Modernization Every automation and control system requires upgrading at some point to maintain safe and reliable operations and leverage the latest technology. Increase insight. Reduce risk. Feel confident. Effective Threat Management. Building a complete lifecycle to manage enterprise threats. White Paper. Intuition Operations Monitoring: Latest Software for Improving Plant Performance, Reliability and Safety.